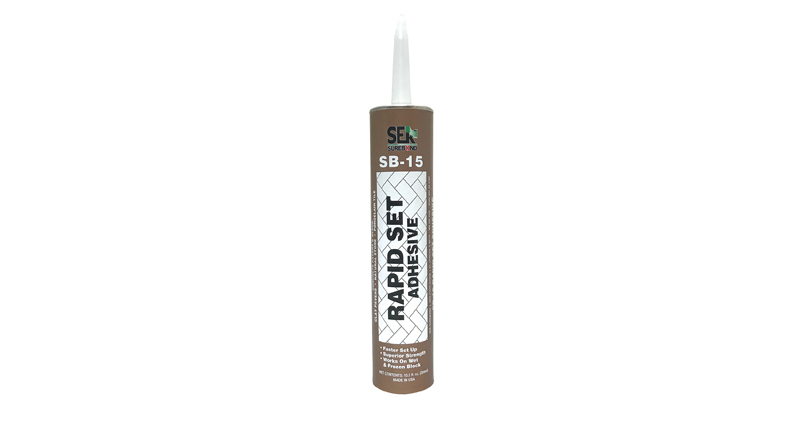 New to our SEK Adhesives line up, SB-15 Rapid Set is our fastest to set up and strongest adhesive that we offer. It will adhere well in temperatures ranging from 10° – 100°F and can be applied on frozen and/or damp substrates. SB-15 Rapid Set’s superior durability will withstand extreme wear and tear including heavy vehicular traffic. It helps to level and shim and can be applied easily with a standard caulking gun. Ideal for Caps, Steps, Columns, Seat Walls, Retaining Walls, Grill Surrounds, Outdoor Kitchens and any exterior application where a superior strength bond and quick set up is beneficial. Suitable for concrete pavers & block, clay pavers, coping systems, masonry and brick, natural and manufactured stone, slate and porcelain tile. 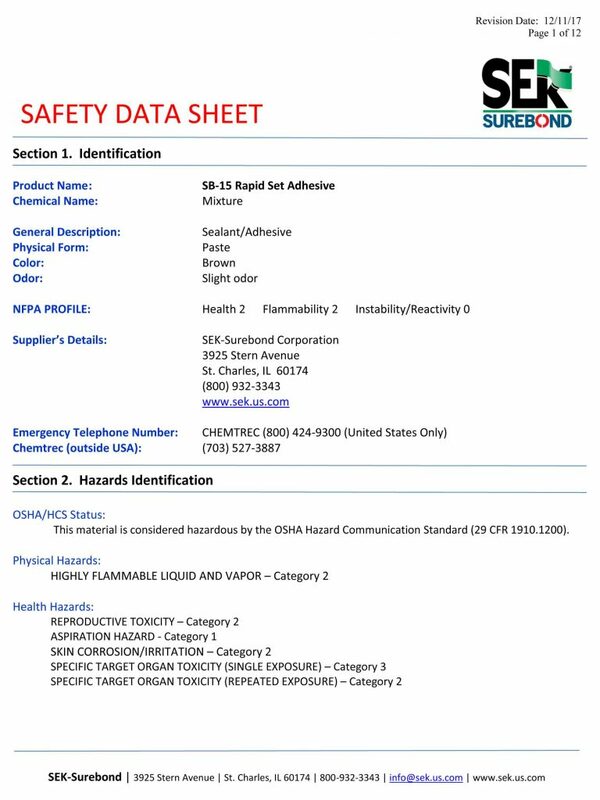 Also bonds to other building materials such as aluminum, painted surfaces, fiberglass, laminates, steel, plastics, metal, glass and wood. SB-15 Rapid Set is an ultra-fast set up, quick curing, superior strength, structural grade hardscape adhesive. It will adhere well in extreme conditions such as temperatures ranging from 10° to 100° F, and on frozen and/or damp substrates. SB-15’s superior durability will withstand extreme wear and tear including heavy vehicular traffic. It helps to level and shim and can be applied easily with a standard caulking gun. 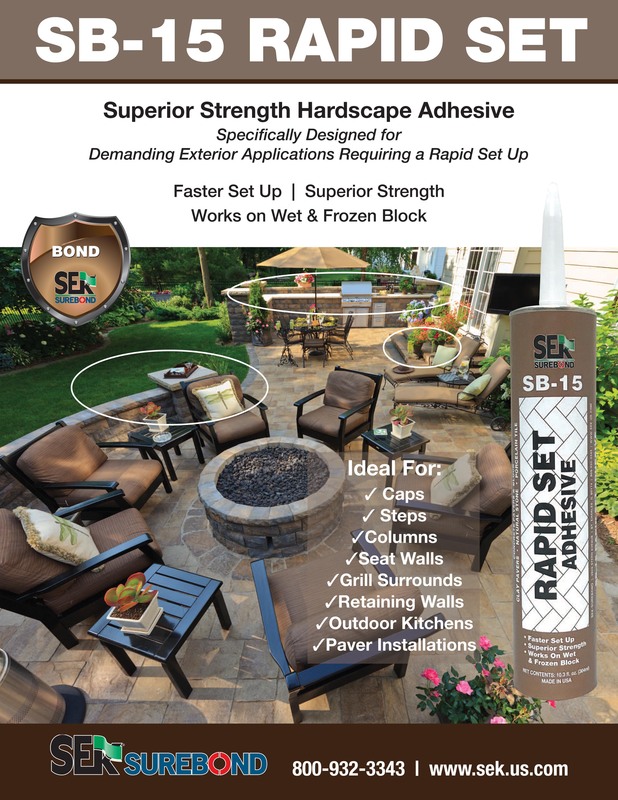 SB-15 Rapid Set is ideal for retaining walls, seat walls, columns, caps, steps, outdoor kitchens, grill surrounds, paver installations, coping systems and more. Suitable Surfaces include: concrete pavers & block, clay pavers, natural & manufactured stone, slate and porcelain tile. Also bonds to other building materials such as aluminum, painted surfaces, fiberglass, laminates, steel, plastics, metal, glass and wood. Before application, inspect pavers or stones to ensure they are smooth, flat and of the same height. Substrate must be structurally sound with no spalling, cracking or scaling. For ultimate adhesion, surface should be clean, free from dirt, oil and grease, excessive water, ice or any other material. If cleaning is required, prepare surface with SureClean Deep Penetrating Multi-Use Cleaner. Rinse thoroughly and let dry before applying SB-15Rapid Set. To ensure final assembly, dry fit all pieces prior to applying SB-15 Rapid Set. Proper drainage must be provided so that water does not drain into and collect in adhered areas. Cut nozzle to desired size and puncture inner seal. Apply a 1/8” to 3/8” bead of SB-15Rapid Set using a caulking gun. On most applications, apply SB-15 Rapid Set in an ‘S’ shape. Where there is a potential for moisture infiltration, apply multiple lines of SB-15 Rapid Set parallel with the drainage flow. Positioning and aligning should be done within 10-15 minutes of application. For optimal adhesion, position block& move slightly back & forth or side to side to spread bead out in between the units. SB-15 Rapid Set skins over at 5 minutes and has an open time of 10 minutes. Full cure is achieved at 24 hours (1/8” bead) depending on bead size and environmental conditions. For clean-up of tools, while uncured, use toulene following manufacturer’s instructions and precautionary information.